With great power comes great responsibility, and apparently some criticism. 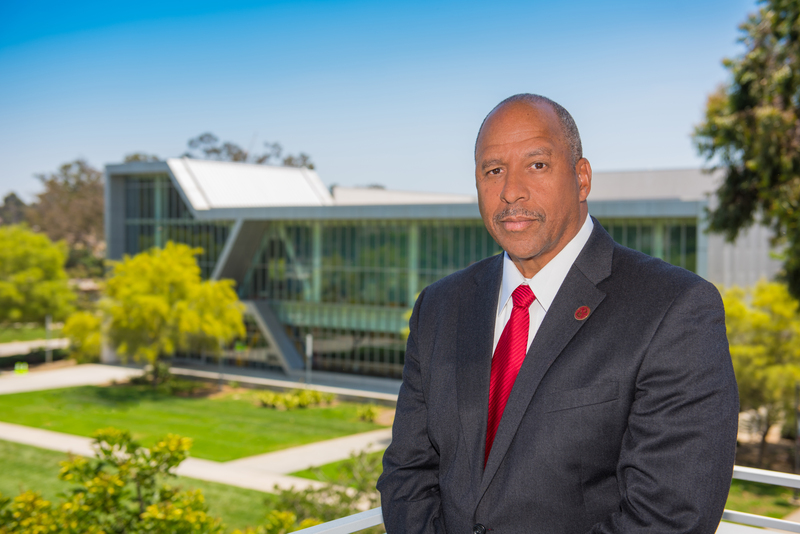 The first eight months of President Thomas A. Parham’s tenure as president of California State University, Dominguez Hills have been no exception. During his first semester on campus, the Los Angeles Times broke a story with a scandalous claim that the new president had committed gender pay discrimination at his previous university. The university closed its pool and theatre on claims that they were unsafe for students. And the university and chemistry department faced fines up to $80,000. While this was not the start that Parham was hoping for, it was the one he was given. And in difficult situations we are all left with two options: fight or flight. Deal with the problems in front of you head on or avoid them hoping they go away. Parham, who is a licensed psychologist and earned his master’s and Ph.D. in counseling psychology, chose to face his problems head on. He has steadfastly denied the claims made in the UCI report and says he’s swiftly moved to deal with safety concerns regarding the university. Parham describes his first reaction to the claims by former employees and the Times reporting as genuine shock. The claimants allege that Parham paid their male counterparts more than them for the same job. The official report is still under investigation. “What the Times reported on was a leaked copy of a report from one of the claimants who herself, I think, has some secondary gain to be able to get from that,” Parham said. Parham is asking people to judge him based on his record. While at UCI, where he worked from 1985 to 2018, Parham says he was a champion for women’s rights starting the Women’s Empowerment Initiative, which is dedicated to advocating and educating female leaders in the workforce, and insisting on the creation of the women’s resource center on campus. As far as the issues that surfaced pertaining directly to CSUDH, Parham said he did his research before he began working here in June, and that he was well aware of the opportunities and challenges he would face. Among those opportunities, Parham mentioned CSUDH’s high number of minority and first-generation students. More than half of CSUDH students identify with these variables, Parham said. He plans on using this information to advocate the CSU for desperately needed funds at CSUDH. CSUDH has historically received less funding than other CSU universities. According to the CSU website, in 2015 CSUDH received $106 million, whereas California State University, Fullerton received $303 million and Long Beach received $334 million. “It [the Science and Innovation Building] is the first academic building with any kind of state funds that has been built on this campus in 25 years. This is profound neglect,” Parham said. Parham is advocating for CSU funding based on need instead of incremental funding based on number of students, which has historically been how the CSU disperses funds. “The challenges I have, whether I’m larger or smaller, are far more pronounced,” Parham said. And Parham said he is committed to seeing those challenges with his own eyes, and sometimes even discovering them himself. While walking around campus, which he regularly does, Parham discovered exposed rebar in the university pool only marked by some orange cones. Parham says his only choice was to close the pool. But the university pool was not the only structure on the CSUDH campus that is in need of renovations. And while the decisions that led to these problems were not Parham’s, he has now inherited the results. In creating a solution, Parham says the culture at Dominguez Hills needs to change. “The institution had this culture where it was used to tolerating things like that like well that was just us here at Dominguez. No, that’s not the kind of Dominguez I’m coming to lead,” Parham said. As leader of this university, Parham said he plans on taking a hands-on approach to the problems that have long troubled CSUDH. “You cannot say it before you see it,” Parham said of the standard he holds himself and his staff to. He used this motto when dealing with problems with the chemistry labs and facilities that were fined on campus. After he was told the problem was fixed, Parham said he personally walked the areas twice to make sure that they were up to standard. The overriding theme of Parham’s view of his first eight months on campus is that he is well aware that it is only the beginning and his eyes seem fixed far more on the future than past. That is one of the reasons he chose the theme “Transforming Lives that Transform America” for his inauguration week, which he sees this as his main goal at the university. “It really speaks to the quality of experience that I think that we have here … where we literally transform the lives of students that ultimately go out and transform America,” Parham said. He added that while inauguration week and Friday’s investiture ceremony are meant to celebrate a new leader and administration, he would like his to celebrate the campus community as a whole. “I want this investiture and inauguration ceremony to be less about the coronation of a new leader and more about the elevation of a campus community,” Parham said.